We present to you a case of Mr Ali Ahmed,20 yrs old young male resident of Navi Mumbai, who came to Advanced Eye hospital and Institute for a second opinion for treatment of Glaucoma. Mr Ali was diagnosed of Glaucoma 5 months back by an Ophthalmologist. He has been on medication and eye drops since then but all in vain. His eye complains were still there and seemed to get worse day by day. Not to mention the side effects of the medications that caused numbness in his limbs along with itching in his body. Ali got frustrated and depressed due to his eye problems. The pain grew intolerable and his vision got more blurry. One of their relative who visited Ali’s house for a family function suggested taking a second opinion. They mentioned to approach Advanced Eye Hospital and Institute (AEHI), located at Sanpada, Navi Mumbai as they have the best eye surgeon in Navi mumbai and is one of the best eye hospitals in Navi Mumbai. Ali’s parents concern drove them to take an appointment at Advanced Eye Hospital and Institute. On day of appointment as they reached AEHI eye hosptial, they were nervous for they didnt know what to expect for their son. They felt helpless to not have any control over their son's situation. Ali was anxious as well. Ali was thoroughly examined by the optometrist who then forwarded his results to Dr. Rajesh Mishra, Glaucoma specialist. He and his parents were surprised for so many tests werent conducted at other eye hospitals that they conducted. Out of curiosity Ali asked what those machines would do and what they help in. Dr. Rajesh Mishra decribed how the Tonometry was a machine that checks the eyes inner pressure. The eye too have a pressure like our blood pressure which is an integral component in glaucoma. Ali and his parent were amazed for they never knew how glaucoma affects. Then there was another test that was done to check the angle in the eye that would drain the fluid. Not only were they grateful for such thorough checkup but amazed at the technological advancements the eye hospital had. They realised this was the right place for their son's treamtment and grew comfortable. Dr.Rajesh Mishra had asked Ali to stop his medicines eye drops for his eye pressure was high inspite of taking medications. Dr. Rajesh Msihra suggested surgery for these medicines werent helping him and instead lead to complications. Ali's parents decided this would be in his best interest and decided to go ahead with the surgery. On the day of operation a numbing drops were added in Ali’s eyes. Dr. Rajesh Mishra did Trabeculectomy (It is a procedure for the reduction of intraocular pressure) with Ologen Implant procedure on his eyes. Ologen implant is a highly absorbent material that modulates the process of wound healing and restoration functionality with its ability to hold ten to fifty times its own weight in fluids. 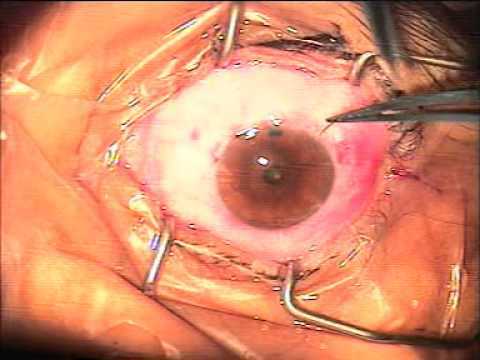 The eye operation ended with one stitch in the eye thatt had to be taken to hold everything in place which would eventually dissolve. Ali was asked to wait in the recovery room for an hour and then sent home. Next day he came for his follow up visit. His eyes were checked by Dr. Rajesh Mishra. His healing seemed to show improvement with slight decrease in his eye pressure. In his next follow up after a week, Ali said he could see his vision improving and he could see much clearer than before. Mr Ali and His parents thanked Dr. Rajesh Mishra for his Son’s eyes and helping them out in times of distress. It is an eye disorder which leads to progressive damage of the optic nerve in a characteristic pattern. The optic nerve is involved in carrying the visual impulse from the retina to the brain enabling us to see this impulse as vision.